This roasted vegetable salad features beets, carrots and cauliflower tossed in a maple balsamic dressing with a toasty, nuttiness from pecans and a little sweetness from golden raisins. Happy Holidays, all! We’ve had an unseasonable winter thus far in Chicago. Last weekend it was 60 degrees, which I don’t think has ever happened in my lifetime. Yes, I enjoy the warmer weather (this could be -40 degrees like the last couple years), but it’s a little disconcerting. It worries me about global warming, but more importantly, it makes it hard to get in the holiday spirit. What I really love about the holidays, though — and I think most people would agree — is getting to spend time with good friends and family and enjoying delicious food. So that’s what I’ve been trying to amp up. I’ll be posting the recipes throughout this week. I promise, they’re all very easy and can be done in part ahead of time. Hope you enjoy! 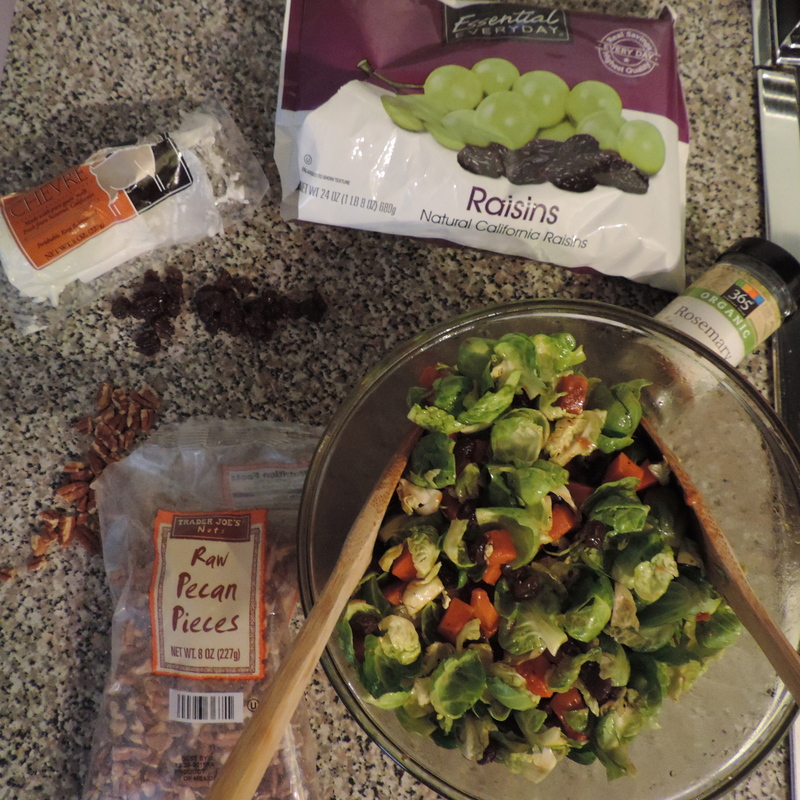 Change out the standard lettuce-based salad for this one featuring roasted vegetables, toasted pecans and golden raisins. 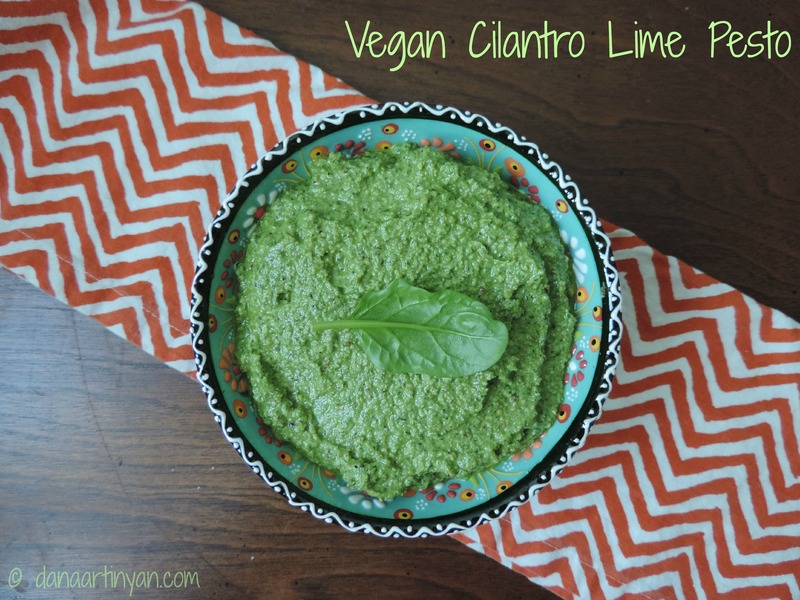 This would pair well with chicken or turkey, or would be fantastic over a bed of kale if you still want some greens in your salad. I’d say I’m not scared of too many spices. 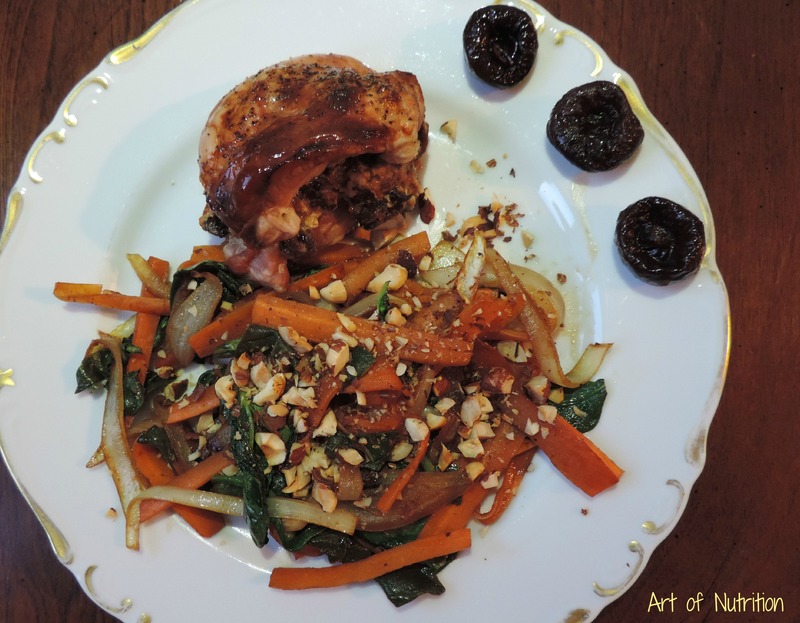 I love to combine spices in unusual ways to completely alter/upgrade a recipe. So at first, I was completely stumped. Then, like a gift from the gods, my friend gave me some amazing saffron. I like the flavor and color that saffron brings to recipes, but I had never used it in my own cooking. So, I started doing my research and one article gave mention of using saffron with cinnamon and cumin — SOLD! Saffron can give a bitter taste to dishes if not treated properly. To make sure I mantained the beautiful taste and depth that saffron can lend, I first ground the saffron using a mortar and pestle (my Grandma’s mortar and pestle, in fact — brought all the way from Turkey). Then, I steeped it — like you would tea — in hot (but NOT boiling) water for about 30 minutes, yielding the most beautiful golden liquid. From there, it was time to make stew! 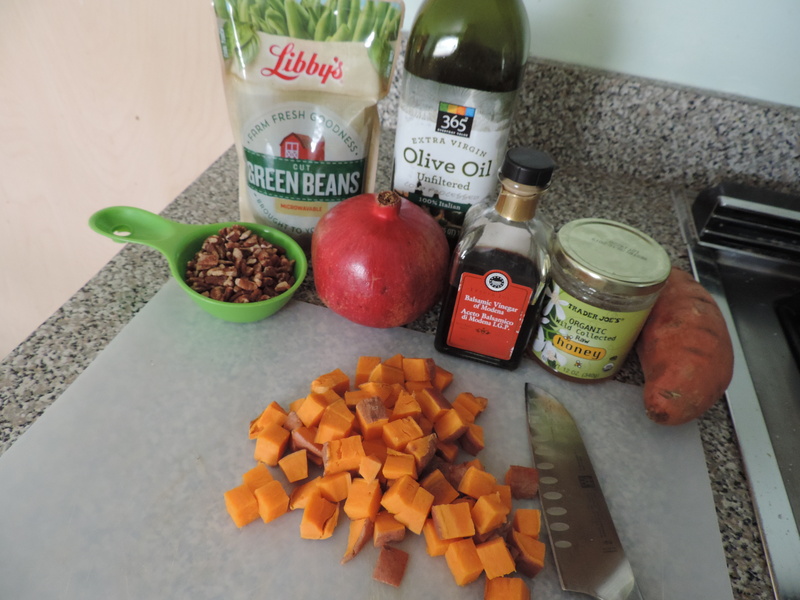 Not just any stew…Moroccan-style, VEGAN, warming stew. Enjoy! 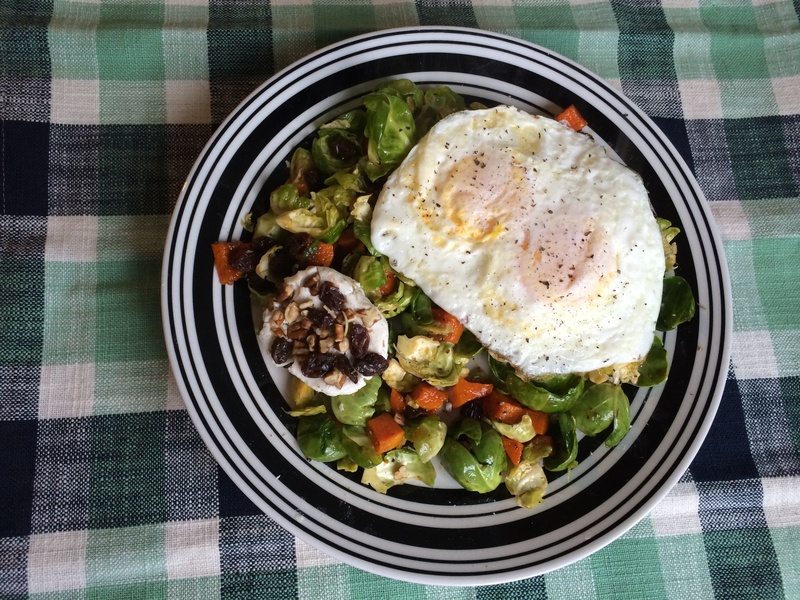 This dish is perfect for a cool fall day. If you need gluten-free, use one block of extra firm (crumbled) tofu in place of the tempeh. Heat 1/2 cup water until hot, but not boiling. While water is heating, grind saffron using a mortar and pestle, or even with your fingers if you don’t have a mortar and pestle. Add the ground saffron to a small dish and pour hot water over it. Let steep. In a large pot, saute onion in oil. Once onions are translucent, add mushrrooms and eggplant and saute for 10 minutes. 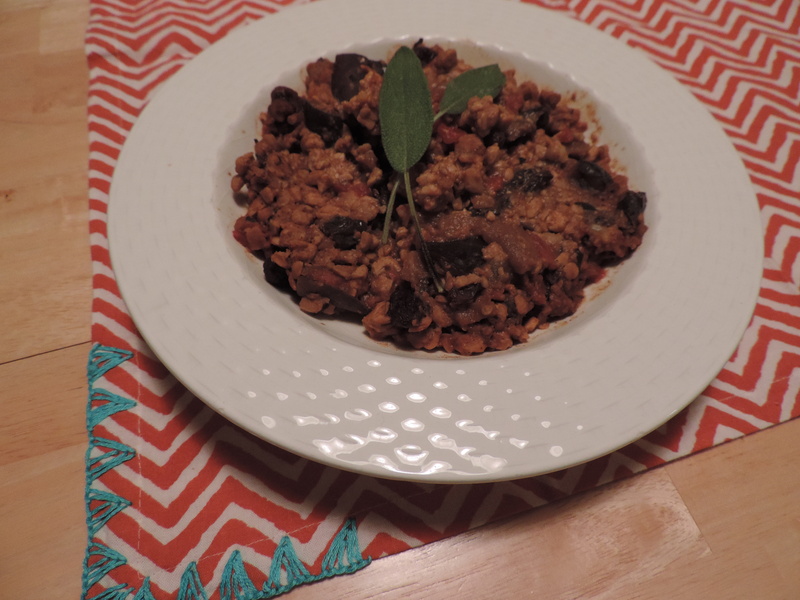 Add tomatoes, crumbled tempeh, spices, salt, apple juice, steeped saffon/water combo and raisins and simmer for 30-45 minutes. Garnish with raisins or a sprinkling of ground saffron if desired. Check out how fellow Recipe ReDuxers use “spooky spices” by clicking on the little blue guy below. Enjoy! The fact that I could never duplicate that dish could be attributed to many things — I didn’t use enough oil, I went too light on the garlic, I used the wrong type of yogurt for the sauce — but when it all boils down, no one can do it better than Grandma. Am I right? While I love my Grandma’s eggplant dish, I myself could never really get eggplant right. It would turn out soggy or tasteless or morph into a weird texture when cooked. I loathe eggplant because I am a perfectionist and, well, the things I created up until now were far from perfection. I’m always up for a challenge, though, so for this month’s Recipe ReDux theme of dehydrated food (either doing the dehydrating yourself or incorporating dehydrated ingredients into a dish), I figured it was time to meet my culinary nemesis. Eggplant, you ain’t got nothing on me. Doesn’t hold a candle to Grandma’s Eggplant, but it’s pretty damn delicious. 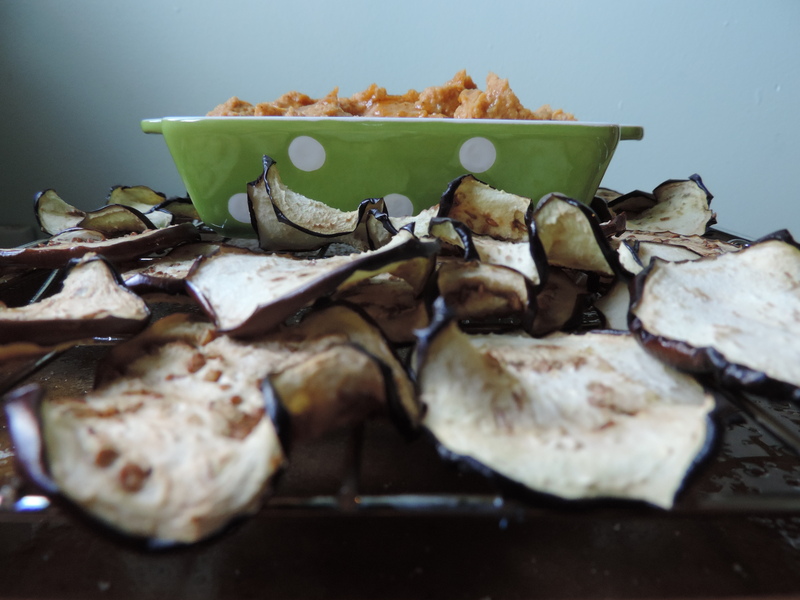 It turns out eggplant chips aren’t so difficult. And you don’t even need a fancy dehyrator. Nope, these were dehydrated right in our old crappy oven. 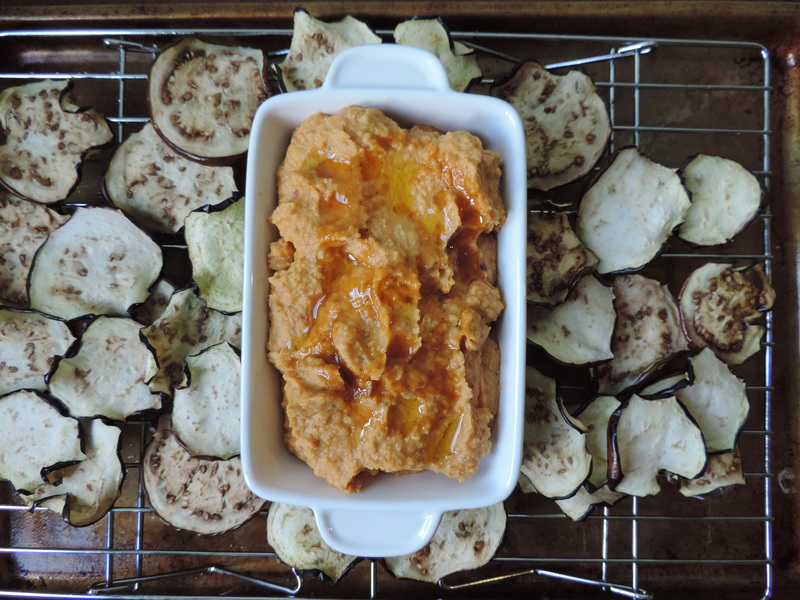 What really makes these eggplant chips, though, is that dreamy pumpkin hummus made with roasted garlic. Do you all know the trick to peeling a lot of garlic very quickly? Peel the outside layers off of the bulb, plop the whole thing in a container with a lid, and shake it like a Polaroid picture. Like, really shake it. Your muscles should be sore, no joke. 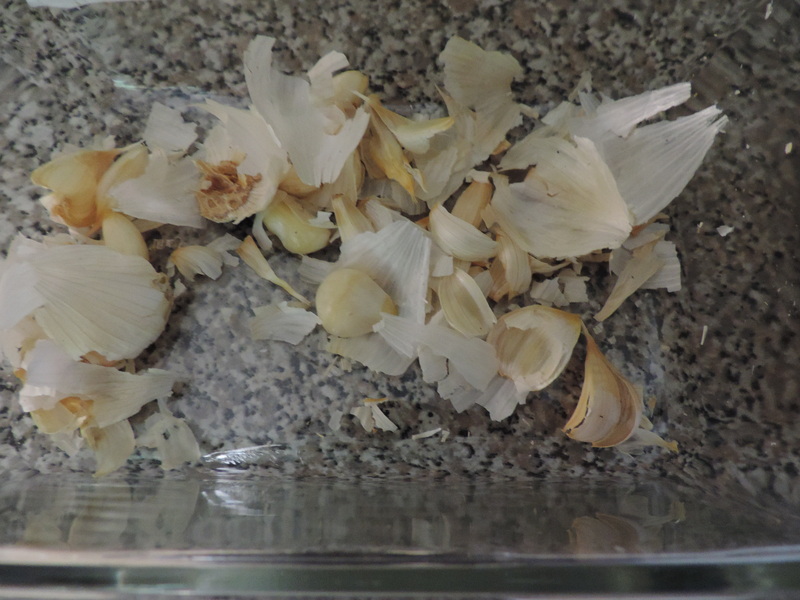 I don’t know how, but this assault to the garlic magically gets all of the peels off while keeping each clove intact. This is a great party trick, depending on the type of party. So once you’ve magically peeled your garlic, it’s ready to be roasted on the stove. Just place it in a small saucepan, pour in enough olive oil to cover the cloves fully, and heat the oil/garlic until it starts to simmer. Then remove from heat and let cool. You now have both roasted garlic AND garlic-infused olive oil! Now what to do with all of this deliciousness? Hummus, obviously! 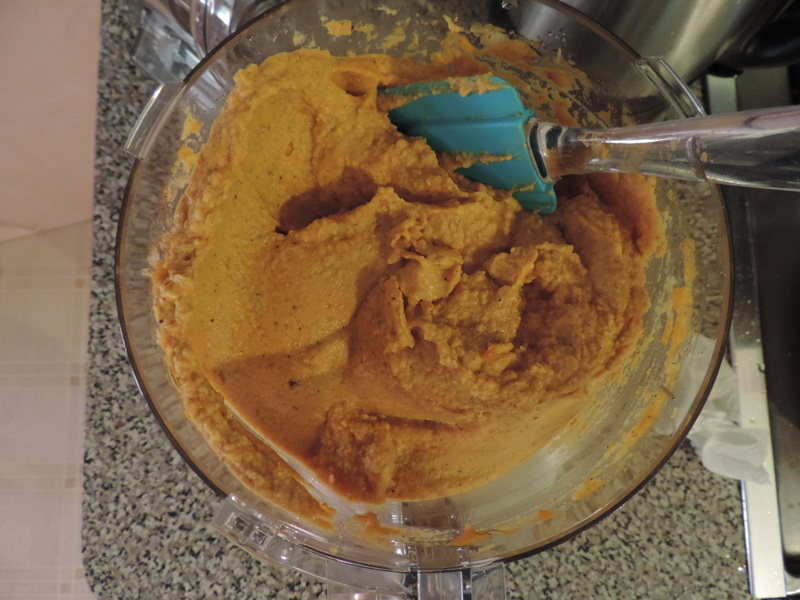 And since it feels like fall in Chicago, PUMPKIN hummus. 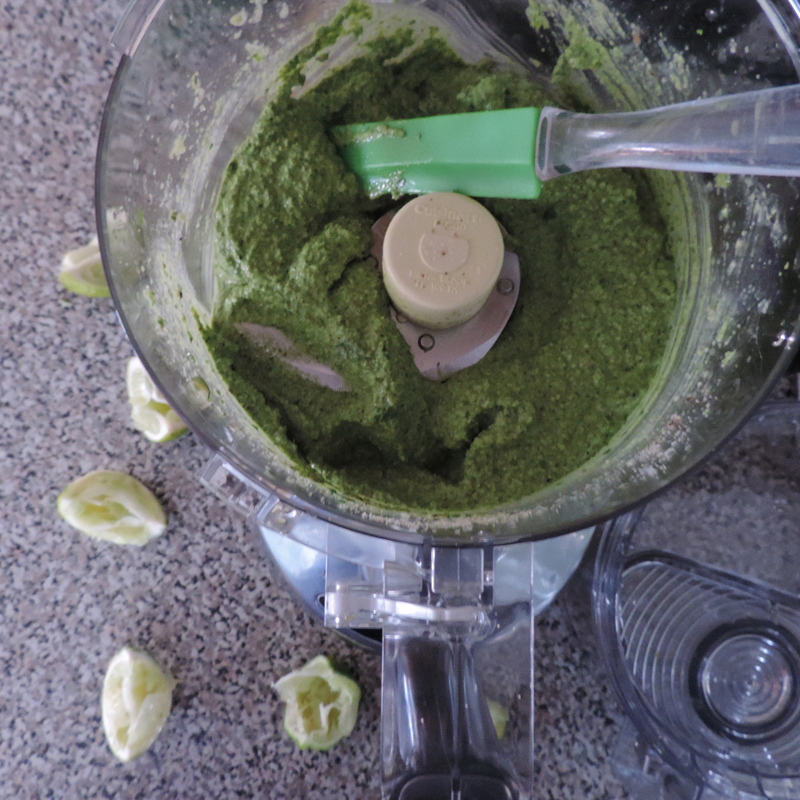 The roasted garlic and garlic oil also make an excellent pesto sauce, FYI. 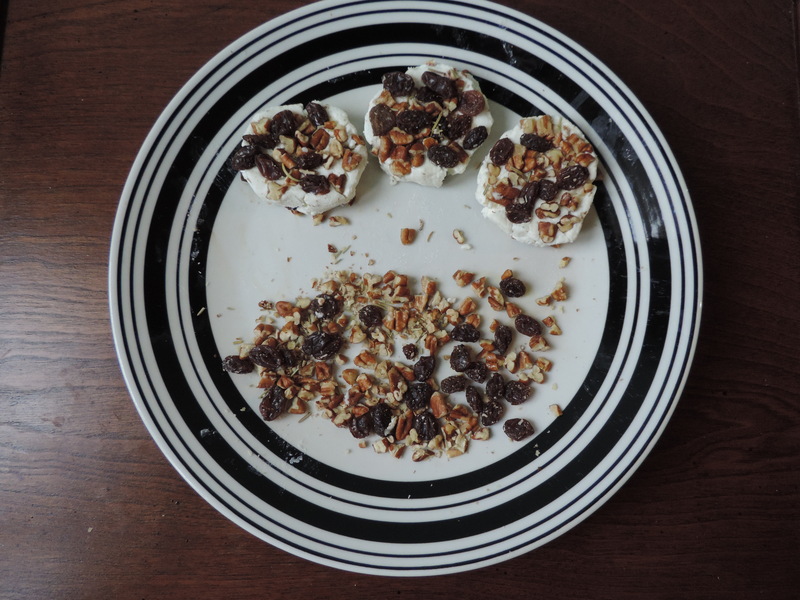 You can eat these together or separately, they are both delicious in their own right. I can’t wait to try the eggplant chips with a yogurt sauce and the hummus with, lets be honest, everything. Man I love hummus. 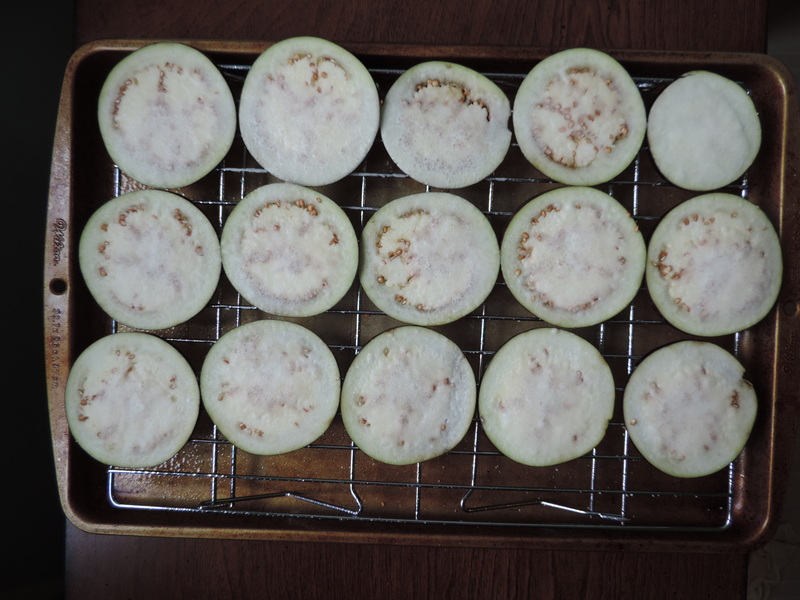 1 medium eggplant, sliced into very thin rounds (1/8″ or 1/16″). Use a mandolin if you have one. Place metal cooling racks on top of baking sheets (I needed two in order to fit all of the eggplant). The cooling racks allow air to circulate around the whole eggplant chip, helping it to dehydrate more effectively. Spray the cooking rack with cooking spray. Salt one side of the eggplant piece, then lay salted side down on the rack. Do this with all of the eggplant rounds, then spray the tops of the eggplant with cooking spray and sprinkle salt over the eggplant (so that both sides are salted). This will help draw moisture out during the dehydrating process. Place baking sheets in oven and bake for 30 minutes. Rotate pans then bake for another 30 minutes. Flip the chips and then bake for another 15-30 minutes, or until the eggplant is slightly browned and crispy. 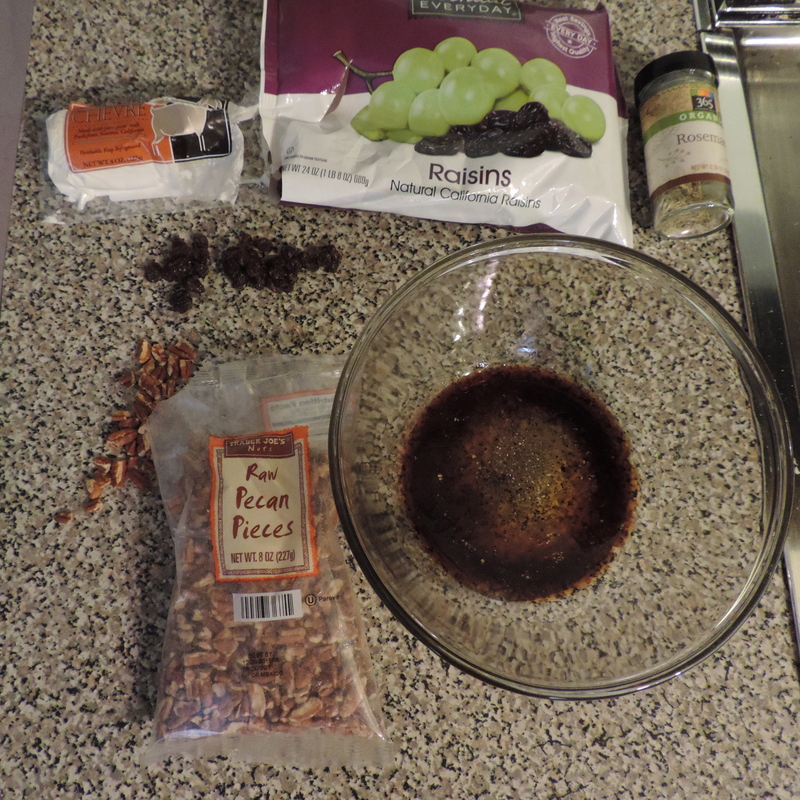 Place all ingredients in a large food processor and process until desired consistency. Refrigerate for at least 30 minutes before serving. Drizzle with honey and olive oil for serving. 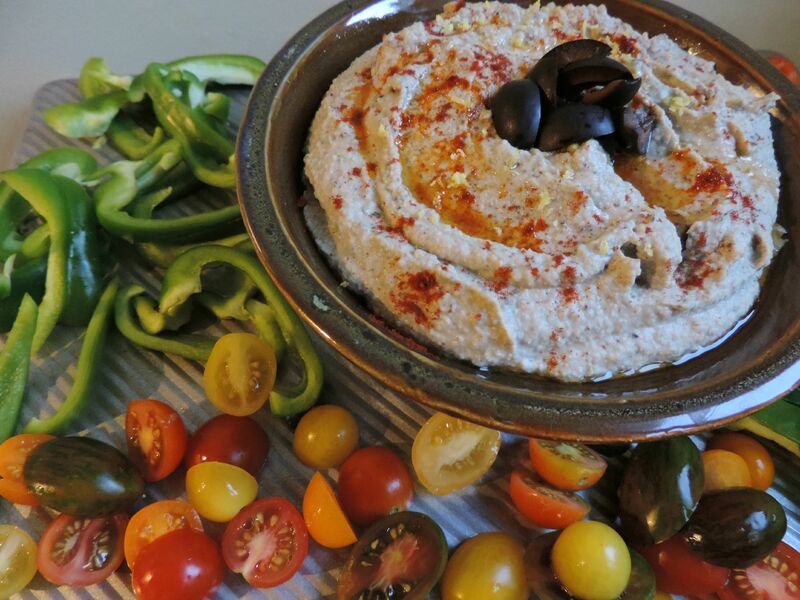 For more amazing dehydrated recipes from the talented Recipe ReDuxers, follow the link below (click on the little blue guy). Happy Labor Day, y’all! (I am not from the south and really should never use the term, “y’all” but it seemed necessary here). If your Labor Day is going to see some BBQ action, make sure there are some healthy options available. This slaw is both creamy from the avocado and tart from the sour apple. It’s the perfect complement to meat or other grilled proteins. If you can’t find sour apples — mine were from my local farmers market — you can most definitely use tart green apples. This recipe is perfect with meat, chicken or fish. 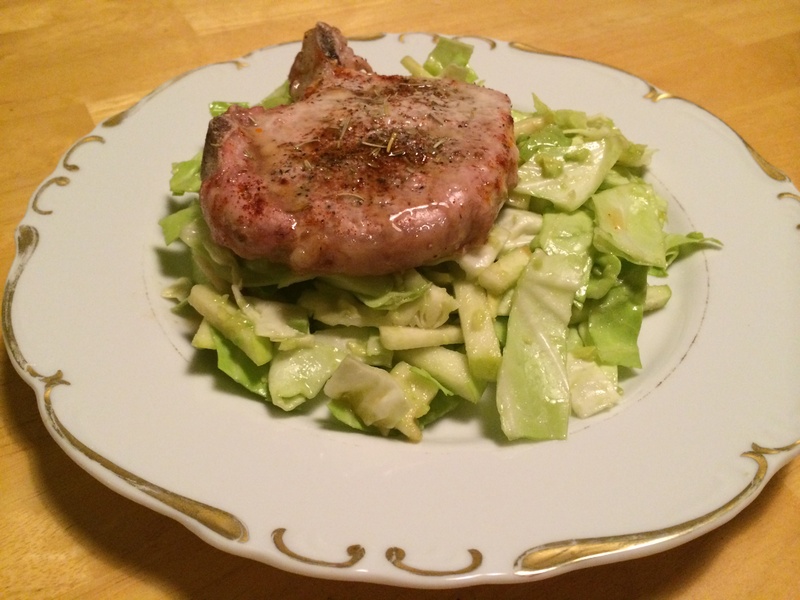 The apples add a nice tartness that cuts through any fattiness of meat. 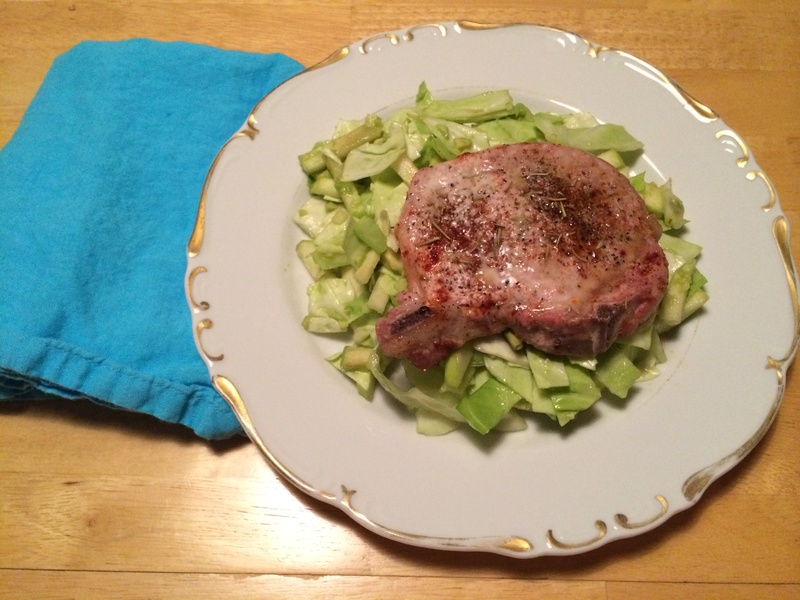 Mix cabbage with mashed avocado, julienned apple, vinegar, lemon juice and salt. Happy Mother’s Day everyone! I just got back from celebrating all of the wonderful mothers, grandmothers and great-grandmothers in my life — they are all truly amazing woman whom I admire so much and can only hope to be like “when I grow up.” I hope that you all were also able to celebrate the mamas in your life today! While May means Mother’s Day for many (and my birthday — hint, hint), it is also Celiac Disease Awareness Month. According to the University of Chicago, Celiac Disease affects 1 in 133 people. These people MUST avoid gluten as consumption of gluten-containing foods (those that have wheat, barley and/or rye in them) causes an inflammatory reaction in which the intestines essentially attacks itself. Luckily, there are an increasing number of amazing gluten-free products out there so that those with Celiac Disease and those who are sensitive to gluten can continue to enjoy their favorite foods. Crackers are one of those foods for me. They must be crunchy when you first bite into them but then turn melt-in-your-mouth buttery and soft as you eat them. They should be a generous size so that you can pile on toppings for a quick snack. And if they have added nutritional benefits — like flax seeds — I’m all over it. 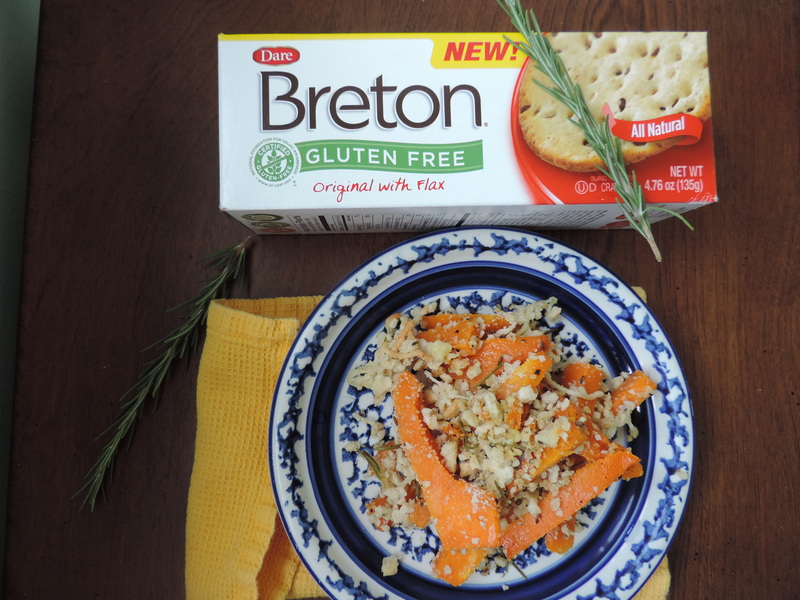 So when the folks at Dare Foods asked us to create delicious, gluten-free recipes using their line of gluten-free Breton crackers, I was thrilled to play around. These crackers exceeded my expectations for what a cracker should be, AND they have the added benefit of being gluten-free! 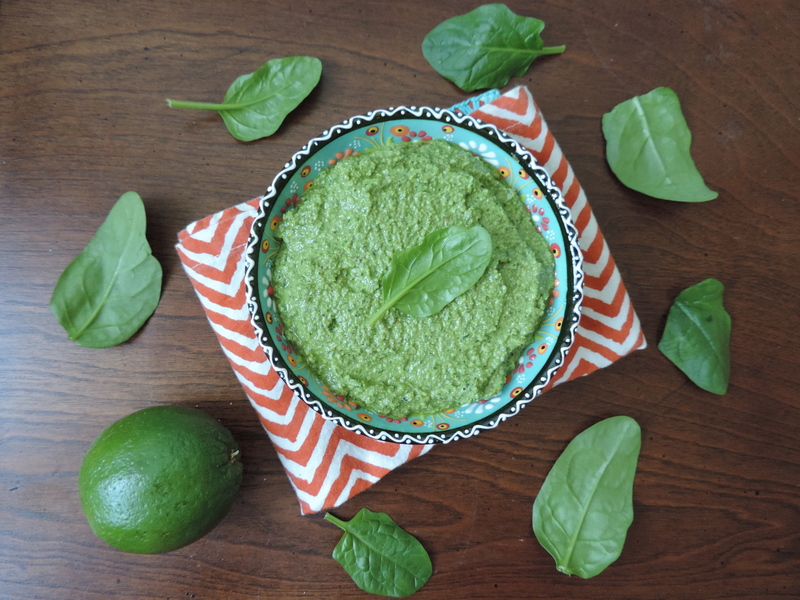 While I enjoy snacking on crackers — especially when I can dip those crackers in hummus, guacamole or some other delicious dip — I wanted to make something a little more special. 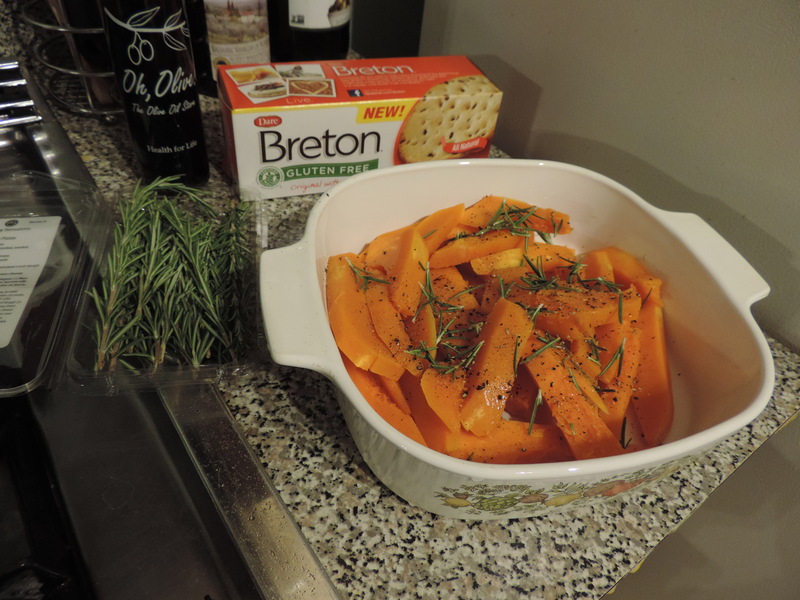 A butternut squash bake with rosemary, cheese, and Breton Gluten Free Original with Flax crackers sounded fantastic to me (and was!). This is a dish that everyone can appreciate, whether gluten-free or not. Enjoy! 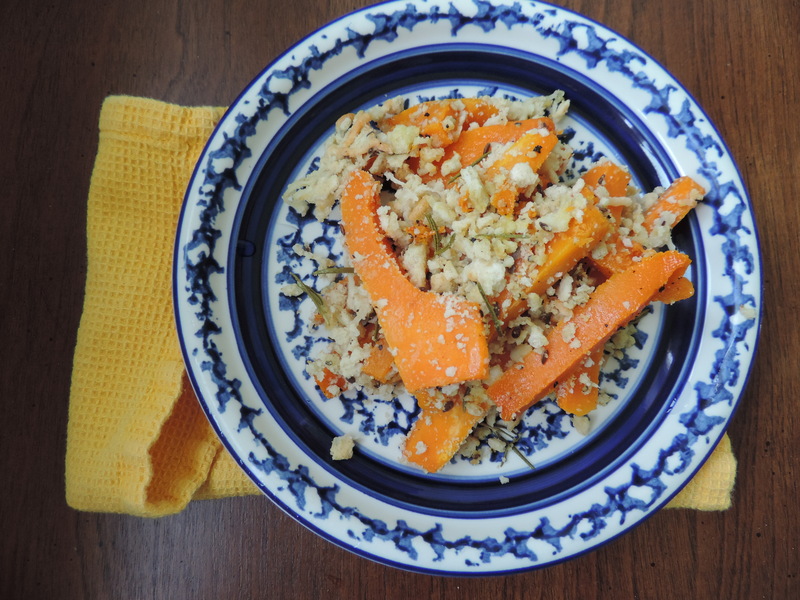 The earthiness of rosemary pairs beautifully with the sweet-nutty flavor of butternut squash. Topped with a crushed Breton Gluten Free Original with Flax crackers/four-cheese blend, the bake is divine! The whole family can enjoy this, whether they’re gluten-free or not. Poke holes in whole butternut squash using sharp knife (be careful here!) Microwave whole, pierced butternut squash for 4-5 minutes, or until squash has softened. Let squash cool for 5-10 minutes so that it is cool enough to cut. Cut squash down the middle (so that stem is one piece and the bottom/base is the other piece). Using a paring knife, cut away the skin of the squash. Next, cut the peeled squash into wedges. Place wedges in a casserole dish. Top the squash with the two rosemary springs (minus the stems). Drizzle with olive oil or butter and sprinkle with salt and pepper to taste. Bake at 375 degrees for 15-20 minutes. 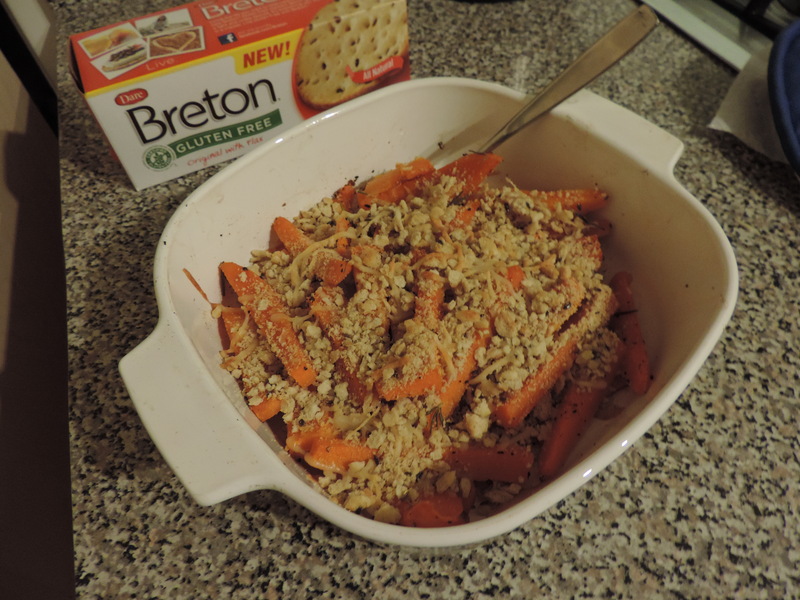 In a sandwich-size zip-top bag, add Breton Gluten Free Original with Flax crackers. Seal the bag and crush the crackers until they become crumbs. Add cheese to the bag, seal, and shake the whole thing around to mix. Remove squash from oven and sprinkle with cracker and cheese mixture. Bake for an additional 5-10 minutes, or until the cheese is melted and the whole thing browns a bit on top. 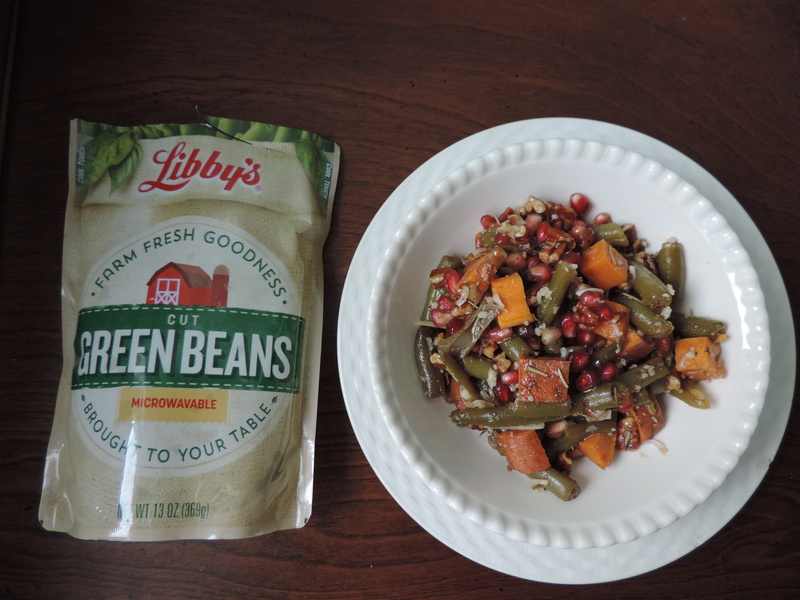 This dish would be great at a family get-together, or anytime to want to add deliciousness to your dinner. Make extra — it holds up really well in the fridge or freezer. 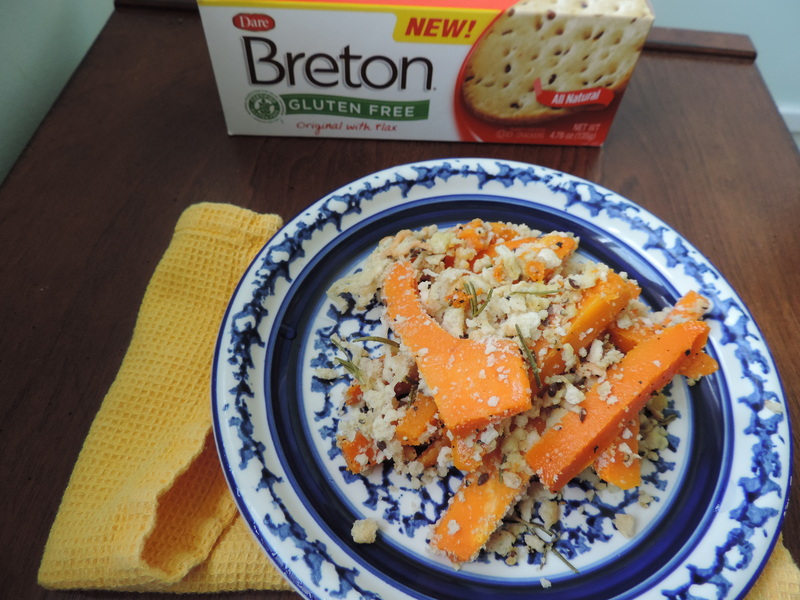 Check out the many other delicious, gluten-free recipes featuring Breton Gluten Free Crackers by following the link below!